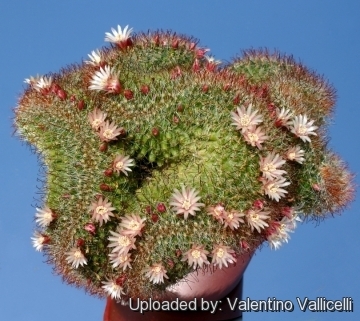 Mammillaria wildii f. cristata hort. Showy and easy to grow, it will form huge flowering mounds up 40cm (or more) in diameter. 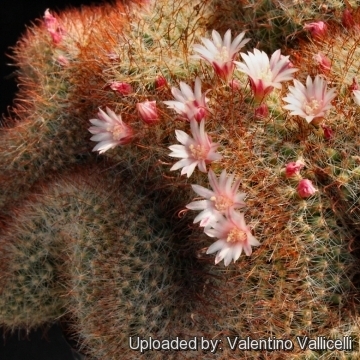 Mammillaria wildiana f. cristata hort. Mammillaria wildii f. compacta hort. 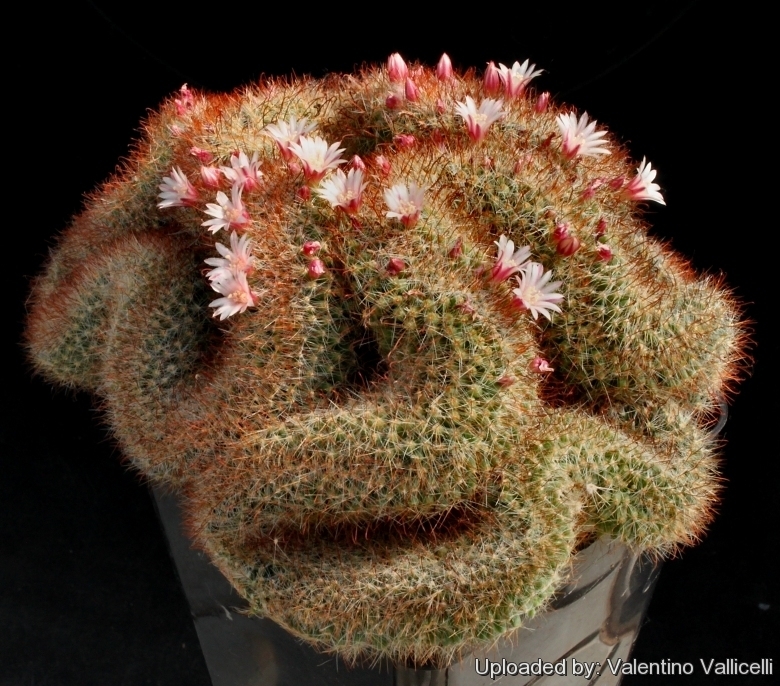 Mammillaria wildiana f. compacta hort. 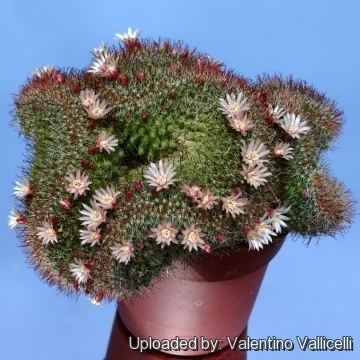 Description: This is a nice crested plant particularly appreciated by collector for its free blooming habit. It can form large tangled, brain like mounds in few years. Central spines: Short brownish yellow hooked, minutely pubescent like in the normal form. Radial spines: 1 to 15, whitish, smooth, 4 to 5 mm long. Flowers: Creamy or pale brownish-yellow, to about 14 mm in diameter. Stigmas greenish white. Cultivation and Propagation: Its qualities and ease of cultivation justify its being an old favourite. It is sometime seen as a grafted plant but grows very well on its own roots too. Soil: Use mineral well permeable mineral soil with little organic matter (peat, humus). Exposure: They need a good amount of light shade to full sun this help to keep the plants healthy, although slow growth. Watering: Water sparingly from March till October (weekly during summertime, if the weather is sunny enough) , with a little fertilizer added. Less or no water during cold winter months, or when night temperatures remain below 10° to prevent root loss. It is sensitive to overwatering (rot prone). Crested growth: Unlike 'monstrose' varieties of plants, where the variation from normal growth is due to genetic mutation, crested growth can occur on normal plants. Sometimes it's due to variances in light intensity, or damage, but generally the causes are unknown. A crested plant may have some areas growing normally, and a cresting plant that looks like a brain, may revert to normal growth for no apparent reason. If you have any of the crested part left you need to remove the normal growth and leave the crested part behind this will need to be done regularly. Propagation: Grafting or cuttings. 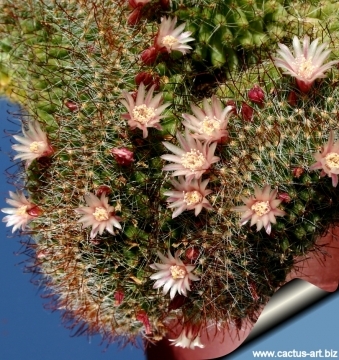 Plants are usually grafted onto column-shaped cacti but proved to be able to produce their own roots if degrafted. Cuttings will take root in a minimum temperature of 20° C (but better in hot weather). Cuttings of healthy shoots can be taken in the spring and summer. Cut the stem with a sharp, sterile knife, leave the cutting in a warm, dry place for a week or weeks (depending on how thick the cutting is) until a callus forms over the wound. Once the callus forms, the cutting may be inserted in a container filled with firmed cactus potting mix topped with a surface layer of coarse grit. They should be placed in the coarse grit only; this prevents the cut end from becoming too wet and allows the roots to penetrate the rich compost underneath. The cuttings should root in 2 to 6 weeks. Large crested piece must be placed on the soil surface without burying the plant base down in the soil.